It was only a matter of time, but who would have thought that Snapchat could literally destroy the very essence of civilisation? Scientists have claimed that aliens could bring down society as we know it, by hacking our Facebook, Snapchat and Instagram accounts to send subliminal mind waves to the core of our brains which could tear apart our very being. In the new research carried out by scientists, it was revealed that extra-terrestrial aliens would prefer to wipe out humanity on Earth, one person at a time in a calculated elimination process rather than send in a fleet of UFOs as depicted in most of Harvey Weinstein’s Hollywood movies. Researchers have said that cyber-attacks, most specifically, personalised targeting of social media accounts which hold such information as user ID’s and locations, would give alien beings the best shot of taking over the planet. Maybe aliens already have taken over our social media pages. Remember when President Donald Trump tweeted out ‘Covfefe’ and instantly melted the internet? Maybe that was a deciphered message sent out by some other-worldly being letting their fellow martians know that operation ‘Take Over the World’ is in full operation. If aliens have really been taking over our minds, then that would probably explain Hillary Clinton’s weird facial spasms, as well as explain the existence of John Podesta. In regards to how aliens would potentially take over the world wide web and kill us all off, scientists explained that the alien threat could be more on the down-low rather than full on Independence Day massacre. So there you have it. 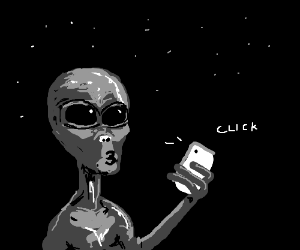 Posting carefully angled and filtered selfies’ on Instagram could not only be damaging your self-esteem and promoting a false sense of reality, but mother f*cking aliens could be taking over your mind right now, as we speak. Not to mention potentially perving on all your half clothed pictures that you post on your Instagram, Snapchat and wherever else! Thanks for putting humanity in potential danger just for the sake of a few crappy ‘likes’ Silicon Valley, it sure does make us feel a lot happier knowing that we’re just one hacked alien ‘radio wave’ signal or cyber attack away from certain death. Speaking of social media superficiality, why don’t you give us a like and a follow on our social media pages? Albeit, we’re probably caught up in the Silicon Valley conservative shadow ban, but give us a like/follow anyway if you want live updates on when our latest articles go live on the website! Some alien life-form might be subliminally sucking your brains out and giving you a brainstain (quite literally), but at least you’ll be keeping up to date on all the latest information of daily trending news and utter celebrity trash, regardless.